Pacproinc® manufactures stainless steel interleavers (underleavers) and a full line of modular counters/auto stackers for tortillas, empanadas, pitas, burritos, and other portion-controlled bakery products. Interleaving (underleaving) protects your product, improves ease of handling, and improves package presentation by inhibiting bacterial growth and prolonging shelf life. In this way, the PPI-200 helps to safeguard and enhance your brand image in a competitive market space. 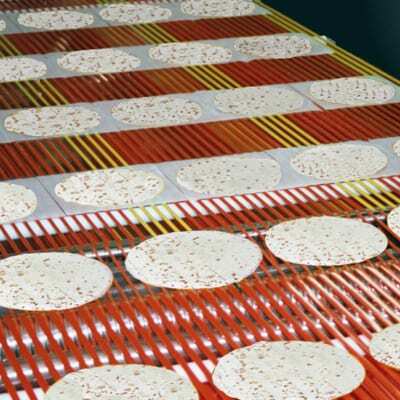 The Pacproinc® PPI-200 interleaver automatically places paper, film, or foil under raw, baked, or par-baked tortillas. Without interleaving, even cooked tortillas can stick together; the PPI-200 improves freeze release, ease of preparation, sanitary handling, shelf life, portion control, separation, and package presentation. This video shows the Pacproinc® EV-9 Interleaver and Stacker cutting high-density polyethylene from roll stock, inserting under an empanada shell (commonly referred to as discos), counting the shells, and stacking them to the desired count. The EV-9 Interleaver and Stacker are independent from upstream equipment and can interface to virtually any upstream dough sheeters or downstream packaging equipment. This equipment works well with any product between 3″ x 3″ and 9″ x 9″ including items like pot-pie tops, pasta sheets, or cookie dough. Don’t need interleaving? No problem. Pacproinc® offers a variety of modular counter/stackers to fit any application, and our custom designs easily interface with upstream production equipment and end-of-line packaging machinery. High-speed, sanitary, hands-free counting/auto stacking guarantees better, more accurate stacks for easier packaging and improved product presentation. Like all of our designs, our stand-alone counters/stackers feature rugged, stainless steel construction and climate-controlled, fully gasketed enclosures. Our PLC design enables easy production setup and changes to parameters like stack count, delay, speed, and portion thickness, and our solutions are easily networked with other equipment to seamlessly interface with production requirements like product changeover or stoppages. Pacproinc® can configure your PPI-200 to accept product in single or multiple lanes. We can also singulate (combine multiple lanes into a single lane) finished stacks for delivery to the packaging machine, and all stackers can be fitted with our Remote Monitoring and Diagnostic System (RMDS). Whether you are interleaving and stacking or just stacking, many of Pacproinc®’s auto stacking modules have the ability to load your counted and stacked product directly into the package. We have extensive and unique experience handling stacked food products, which allows us to introduce finished stacks directly into trays, cartons, or pockets.